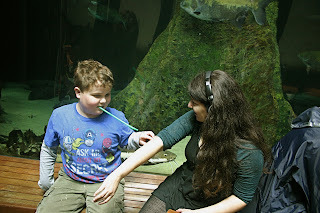 and having fun with -- other autistic people. It's World Autism Acceptance Day, which kicks off World Autism Acceptance month. Those are not usually exciting statements for us -- historically April overwhelmingly generates pity-based "autism awareness" campaigns, but we're seeing a lot more positivity and autism acceptance this year. More acceptance is fabulous, and very welcome. Acceptance rather than mere awareness is being honored at non-autistic-centric places as diverse and cool as the United Nations, where NeuroTribes author Steve Silberman gave the #WAAD16 opening keynote; most successful company in the world Apple, which produced an Autism Acceptance video featuring a non-speaking autistic teen successfully using AAC to communicate at home, and at a regular high school; and feminist nerdgasm site The Mary Sue, featuring autistic writer Nova Mona's essay Autism Doesn’t Make Me Blue: How to Support Autistic People This April. "Acceptance means autistic people matter. Awareness just means we know autistic people exist. Awareness doesn't draw any distinctions between epidemic-mongering, pseudo-science-promoting parents publicly embarrassing their autistic children, and autistic people themselves speaking up for better recognition and inclusion." Autism Women's Network's Help Make April Amazing! And here at TPGA we'll be featuring autistic voices all April long, talking about Why Accommodations Matter. We have some truly great essays lined up, so come back daily and watch that Autism Acceptance needle get pushed a little bit forward, every day.